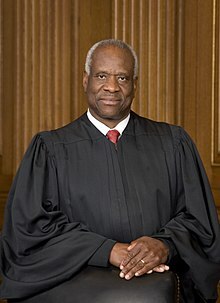 Clarence Thomas (born June 23, 1948) is a Justice of the Supreme Court of the United States. He was born on June 23, 1948. Thomas has been a Justice since 1991. He is the only African-American currently on the court. He is also the second African American to ever serve on the court. The only other African American was Thurgood Marshall. During his confirmation process, Professor Anita Hill accused Thomas of sexual harassment. Regardless, Thomas was confirmed in October 1991. Clarence Thomas was born in Pin Point, Georgia. His father left his family when he was only two years old. He did not meet his son Clarence again until Clarence was nine years old. This left his mother, Leola Anderson, to take care of the family. Clarence and his brother were sent to live with his mother's parents in Savannah, Georgia. His grandfather wanted him to become a priest. Thomas was sent to St. John Vianney Minor Seminary, an all-white boarding school near Savannah. In 1968 he transferred to the College of the Holy Cross in Worcester, Massachusetts. He gave up all ideas of becoming a priest after the death of Martin Luther King Jr.. Thomas then obtained a law degree at Yale University. After Yale he returned to Missouri and worked for State Attorney General, John Danforth. in 1977 Danforth was elected to the U.S. Senate. Thomas became a corporate lawyer for the Monsanto Company. Two years later he became Danforth's legislative aide in Washington, D.C.. President Ronald Reagan offered Thomas a job as the assistant secretary for civil rights in the U.S. Department of Education. He then became the chairman of the U.S. Equal Employment Opportunity Commission. Thomas was appointed to the United States Court of Appeals for the District of Columbia Circuit in 1990 by President George H. W. Bush. In 1991, Thurgood Marshall retired from the Supreme Court. Bush nominated Thomas to replace him. He had a hard time getting approved so that he could become a Supreme Court justice. This was partly because one of his former employees, Anita Hill, claimed that he sexually harassed her. Thomas said that was not true. The Senate confirmed his nomination by a vote of 52-48. All Republicans, except Bob Packwood of Oregon and James Jeffords of Vermont, voted for confirmation. ↑ 3.0 3.1 3.2 3.3 3.4 3.5 3.6 "Clarence Thomas". The Oyez Project at IIT Chicago-Kent College of Law. Retrieved 14 February 2015. ↑ "Clarence Thomas Biography". Bio. Retrieved 14 February 2015. ↑ 7.0 7.1 "Alumni Success Stories". College of the Holy Cross. Retrieved 14 February 2015. ↑ Horvitz, Paul F. (16 October 1991). "Senate Confirms Thomas, 52-48, Following a Final, Bitter Debate". The New York Times. Retrieved 14 February 2015. This page was last changed on 3 October 2018, at 00:40.